Jason Psillakis, DDS, MS is an experienced Prosthodontist providing a wide range of cosmetic, restorative and preventive dental services including implants, crowns, bridges, full dentures, partial dentures, veneers, teeth whitening and simple dental restorations (fillings) to keep your smile healthy and beautiful. He prides himself on patient communication and will work with you to ensure a treatment plan that meets your needs. Dr. Psillakis earned his Doctor of Dental Surgery degree (DDS) from the Columbia University School of Dental and Oral Surgery in New York, NY. He completed 2 general residencies with one being a General Practice (GPR) and the other an Advanced Education in General Dentistry (AEGD II) from the Columbia University/Columbia-Presbyterian Medical Center. He then went on to complete his specialty training by obtaining a Master’s of Science (MS) degree in Prosthodontics from Columbia University’s School of Dental & Oral Surgery. When he’s not working on his patients’ smiles, Dr. Psillakis is sharing his knowledge and conducting research as an Associate Professor of Dental Medicine at Columbia University’s School of Dental and Oral Surgery, which is now called the College of Dental Medicine. Dr. Psillakis is a member of the American Dental Association, Psi-Omega Dental Fraternity, Hellenic Dental Society, American College of Prosthodontists, Academy of Osseointegration, and Omicron Kappa Upsilon. 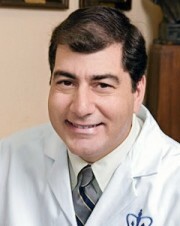 On his free time, Dr. Psillakis enjoys traveling, gardening, and spending time with his family and friends. He is multilingual, speaking English, Greek, and Spanish.